Should the church get involved in politics or influence their voting members? What is the church mandate on this issue? How should Christians project themselves? Two French pastors wondered the same thing, so preached a series of sermons that provided a framework for navigating some of the confusion often generated by the variety of candidates for public office. They also looked at the differing perspectives of church leaders who are trying to evaluate the political picture. Eventually, they developed the series into a book, L’Évangile et le citoyen, Essai sur le chrétien et l’Église en politique, which was published by Editions CLE (Lyon, France), in 2015. In the book, Florent Varak and Philippe Viguier, offer guidelines to assist Christians in determining how best to participate in the political arena as citizens who have a dual citizenship: in heaven and the country of their residence. Now the English edition of this book, translated by Lori Varak and published by BMH Books (Winona Lake, Ind. ), will soon be available. 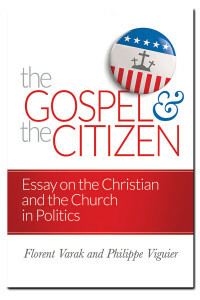 The Gospel and the Citizen, Essay on the Christian and the Church in Politics, will be released July 1, 2016. Though first written for a French audience, their observations have validity for an American audience in this presidential election year. Priced at $10.99 retail, a copy of the book may be reserved at the pre-release price of $6.00, not including shipping. (Click here to order.) The ISBN number is 978-0-88469-313-0. Varak is the director of church equipping at Encompass World Partners. For more than 20 years, he pastored the Lyon Grace Brethren Church (France). A graduate of Master’s Seminary, he also teaches at the Geneva Bible Institute. He and his wife, Lori, have three grown children. Viguier is currently the pastor of the Lyon Grace Brethren Church (France). Also a graduate of Master’s Seminary, he is the author of a thesis on the glory of God, published by Logos and recommended by John Piper. He and his wife Sophia have two young children, and he regularly blogs (in French and English) at philippeviguier.com.